Belize offers something for everyone. For the adventure seeker there is cave tubing, spelunking, ziplining and some of the best diving in the world. For the culture and history buff, Belize is a melting pot of different cultures and has numerous Mayan ruins to explore. A foodie? Belizean food is amazing! Beans, rice, fry jacks (like sopapillas), lobster, conch, barbecue chicken… Oh, my! And for the beach bum, the islands offer you sand, fruity drinks, and as much seclusion and serenity as you seek. Belize with a baby or toddler? No problem! We found the country to be extremely kid-friendly. For anyone planning a trip to Belize, I would encourage you to check out different parts of the country, as they are all vastly different. 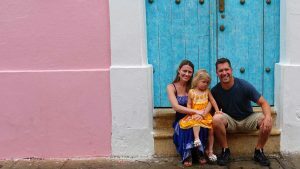 We spent one week in Belize and split our time between Ambergris Caye and the town of San Ignacio in the Cayo District, located in far west Belize. I would have loved to explore the cities of Placencia, Hopkins, and Corazol, but we simply did not have enough time. I would not recommend spending much time in Belize City, as even the locals tell us it isn’t safe. From Belize, a trek into Guatemala is quite easy and worth the trip to visit the Tikal Mayan ruins. 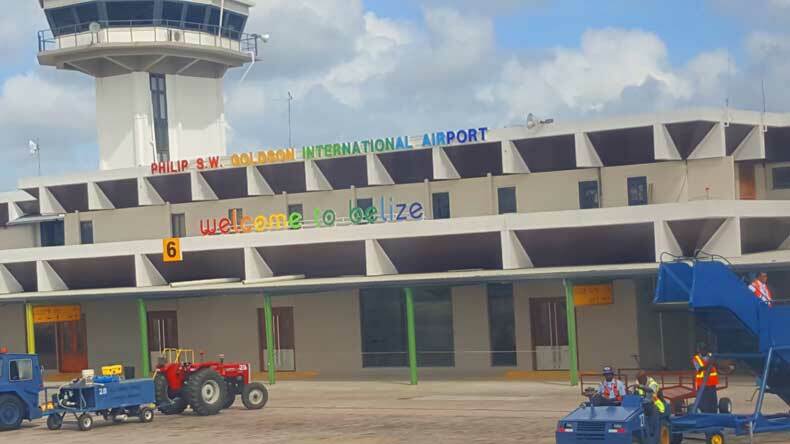 Most likely if you are visiting Belize, you will fly into the Philip S. W. Goldson International Airport located just outside of Belize City. The airport is about a 30 minute drive from the country’s capital city. A total of nine airlines fly into the airport, including all of the major American carriers, United, Delta, American and Southwest. The airport is relatively small, and getting through customs was painless. Depending on where you are going in Belize, you have a few options for transportation from the airport. You can rent a car and drive, get a taxi or arrange a shuttle with your hotel, or if you are heading to one of the islands you can take a 15 minute flight from the airport to San Pedro on Ambergris Caye. You can also get a taxi into town and take the ferry for $20 US per person. Many people visit Belize on a cruise, so you can also arrive in the country by boat. Additionally, you can cross the border between Guatemala and Belize or between Belize and Mexico if traveling by land. 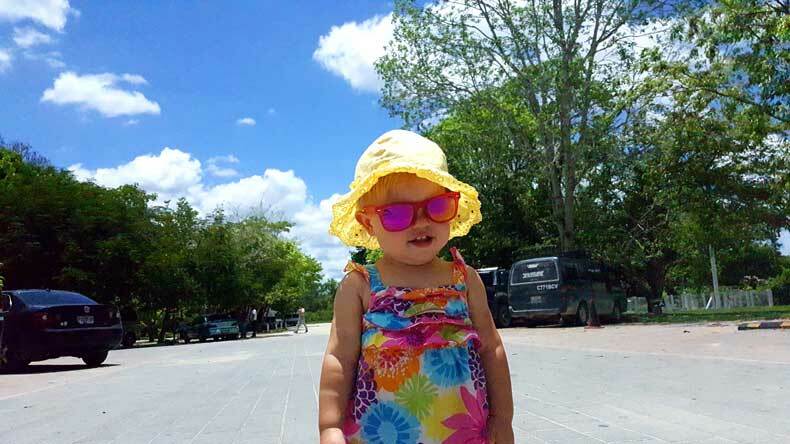 We found plenty to do in Belize with our 16-month-old daughter. In fact, our little blonde baby was a superstar everywhere she went… especially when we made the short drive into Guatemala. While the country of Belize may be known for its adventure sports, it does not lack things to do with a little one in tow. Visiting Belize with a baby or toddler can be a fun trip for the whole family. The native language in Belize is English. And while you while English is widely spoken in Belize, many locals also speak Spanish, Creole (which is kind of English with a Jamaican accent) and Maya, the native language of the Mayan Indians. Stores, restaurants, and hotels take US Dollars or Belizean Dollars. The exchange rate is 1:2. One US Dollar equals two Belizean dollars. You will not find American chains even on the islands that are extremely touristy. I personally found that refreshing, but if you have a serious Starbucks addiction or a toddler that won’t eat anything but McDonald’s, consider yourself forewarned. You can easily buy things you need for your baby, like diapers and milk, in the grocery stores. However, if your baby requires formula I’d recommend bringing your own. Belize is an incredible and inexpensive getaway for a family vacation or holiday. 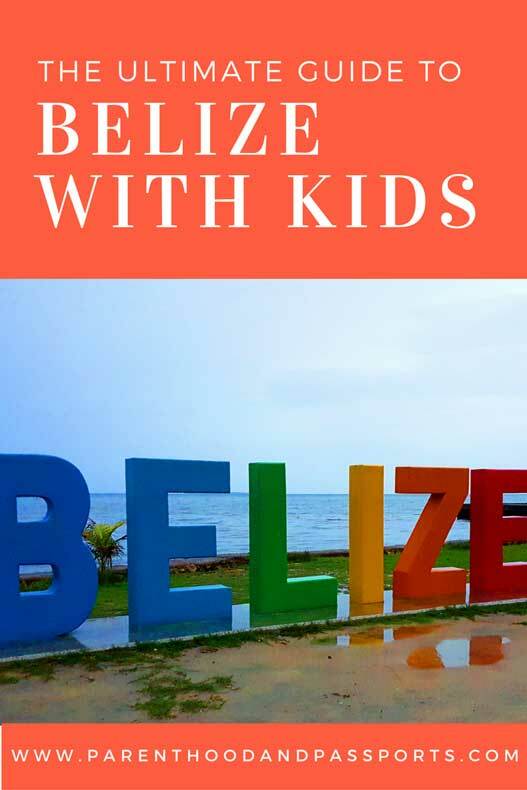 Whether you are seeking a beach vacation or a jungle escape completely off the grid, you and your kids will love visiting Belize. Here is a look at our 7 day itinerary for visiting Belize with kids. Drive to San Ignacio area. Check into a relaxing jungle lodge and unwind after your day of traveling. 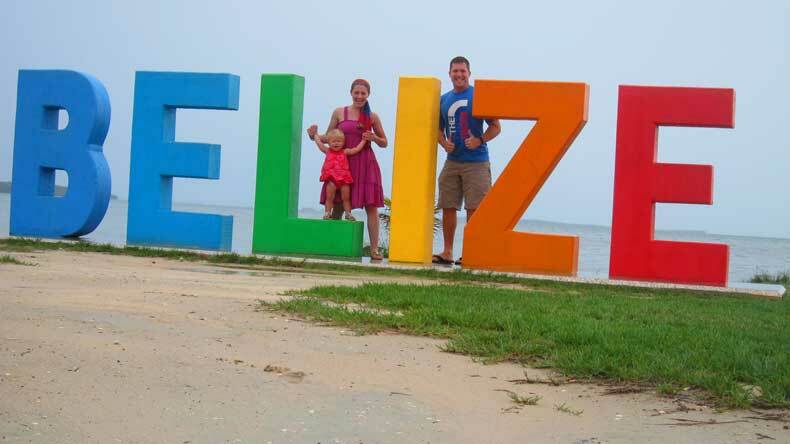 Belize is inexpensive, easy to get to from the United States or Canada, and extremely welcoming for families. While older children will enjoy the adventurous activities like cave tubing and ziplining, there are plenty of activities for families traveling with babies and toddlers, both on the mainland and on the islands. Whether you are looking to explore or relax, Belize has plenty of spectacular places where you can make memories your children will cherish for a lifetime. FIND THE BEST PRICES ON FLIGHTS TO BELIZE WITH SKYSCANNER. Have a question about visiting Belize with a baby or toddler or even older children? We’d love to hear from you. Leave your thoughts in the comments below! Belize is awesome. We stayed at Belizean Shores during our honeymoon. Great resort. It would be nice to get back there with the baby. This post brings back very good memories! We are looking into going with our 4 year old daughter and another couple with their 15 month old daughter, so this is very helpful! Glad you had a good trip! hi Angela, did you do your trip, we are considering going in may with our 4 and 2 yr old? Hi, I’ve booked 13 day (including travel days) in Belize in November. We will have our 4yo and 16m old. This has been really helpful. I have so many questions, but am probably over thinking things. I’ll start with this one, did you feel safe leaving your stuff in your rental car when you went to different places? Or should we always try to leave things at the hotel and just do day trips everywhere? If possible, I’d leave your belongings in the trunk or at the hotel. As a general rule, that is just what we do even when traveling in the US. When we first arrived in San Ignacio we walked around that evening and went to eat while all of our bags were in our trunk. We are looking at going in October with our then 3 year old and 8 month old. We’ve taken the 3 year old to Iceland when he was 18 months and it was great. We’ve never traveled with the baby and my husband is concerned about the baby getting sick from water, food, or mosquitos bc she is so young. She will still be nursing. Did you find that mosquitos were too bad or too little for a baby? We didn’t drink the water. We ordered bottled water everywhere, and I only gave our daughter fruits that had a protective peel (like bananas,etc.) instead of fruit that would likely have been washed in tap water. Hope that helps! Love this article. I’ll be referencing it lots as we plan our trip here. I’d love to hear more about your packing list and budget! What did you budget each day? Did you take a playpen or were they available with most accommodations? Do you have a favourite stroller or carrier for adventure travel? Playpens were available at the hotels where we stayed. Depending on the age of your little one, we love the Ergo 360 for babies and the Deurter Kid Comfort for toddlers. We are going with our 18 month old to Ambergris Caye and San Ignacio. Would you recommend bringing a stroller or just a carrier? Our daughter was close to the same age when we did that trip. We only used a carrier. Depending on what activities you are planning to do, a lot of the paths or roads aren’t stroller friendly. Thanks for this info! What was your experience with car seats? Our son will be four and we would really like to avoid bringing a car seat, but we haven’t found good info about renting a car seat there, or whether we could use a safe rider travel vest in taxis (which requires either shoulder belts in the backseat or a lap belt plus tether option). Any guidance is appreciated! We would love to stick with taxis and public transportation, rather than driving ourselves. And if this matters, we are thinking we will stay in San Ignacio with some day trips and then head to San Pedro. We rented a car seat from the car rental company and found it to be adequate. We did not travel by taxi since we rented a car, so I don’t have any experience with that. Are you planning to take a bus to San Ignacio? It’s a couple hours by car. A lot of the hotels have shuttle services, and you can arrange day trips through tour companies that will pick you up. I think your RideSafer vest should work just fine in the shuttles or taxies though. Hi there! This is very helpful! We’ll be traveling there in January with our three year old and four month old. I was curious if you found places to snorkel from the beach or did you always have to take a tour boat to a place? Thanks for the helpful resource!! You can snorkel off some of the piers, but the closer you get to the beach, the more seaweed you have. I believe Caye Caulker has better snorkeling than Ambergris Caye where we stayed. We want to travel with our 5 month old to Belize and visit the ruins. However , we were worried about the roads being too bumpy or unpaved for our little one. The drive to San Ignacio is how long?? I think the drive was about 3 hours from Belize City to San Ignacio. And the road is fine. A small, two-lane paved road. The drive to Tikal in Guatemala is also fine. Where things will get really bumpy is if you plan to drive into the Mountain Pine Ridge Forest Reserve to get to Caracol.